It's yet another Monday and the event of the year is only 53 days away! 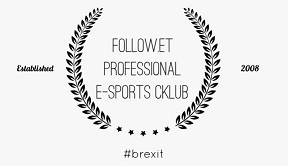 Which means it’s only another 53 days until you will have the opportunity to witness the absolute glory that is #follow.et Professional eSports Cklub. Get your liver ready, because potty is buying drinks for everyone! Anyway, let's start with some questions, shall we!? Anything special happened to you last week? Will you be attending LAN? Are you up for a professional LAN movie by yours truly #follow.et? AND IF THOMM IS CREATING A JOURNAL SIMILAR TO MINE RIGHT NOW: NO THOMM, NO! YOU'RE TOO LATE AND WHAT EVER YOU DO, IT'S UNEXAPEZETEBLE! -> just keeping because of reasons. Just to clarify.... I will not be buying drinks for everyone. Only people who put out when they are absolutley hammered. I can only manage to get through 3-4 people a night so I will opporate on a best looking served first basis. -Going to work at some point. She would wipe the floor of all people who step up. The latest esports news coming from the 1 vs 1 championships is that she beat mixt0r in a best of 5. Hello schnee :) less than 2 months and you can join follow.et getting drunk beyond belief!